Around Christmas time we spend a lot of time thinking about lists. Wish lists, grocery lists, packing lists, to do lists, the list goes on! Here are three lists you can make that will help you improve your relationship with your canine companion, and start to change any behaviors that frustrate you. Make a list of all your favorite things about your dog, and display it where you will see it regularly. This list is the one you will look at when you are feeling frustrated by your dog’s behavior. You can include anything you want, anything that will make you smile, even when you are evaluating the damage to your lawn along your fence-line. This is a list of everything that is important to your dog. Try to be specific, especially when it comes to food and toys, so write “cheese” instead of “treats”. This will become your master list of reinforcers, meaning these are the things that you can use to improve or alter behavior in your dog. Some reinforcers are straightforward to use, like a treat, whereas others may require some creativity, like squirrels! 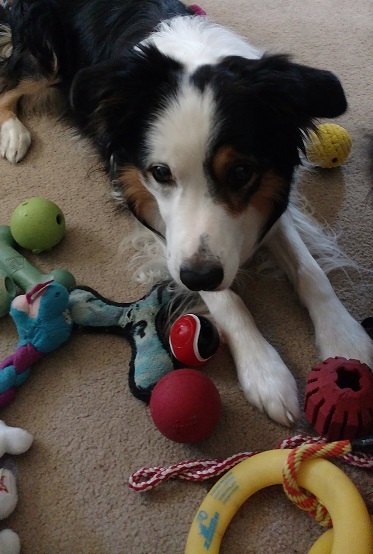 Pirate’s favorite reinforcers were definitely toys! List #3 – What Do We Know? Your last list is all the skills/cues/behaviors your dog knows. This list has several uses, it helps you keep track of what you have taught the dog (especially useful in multi-dog households! ), it’s a great reminder of how awesome your dog is, and we can use it to help us solve behavior problems. When you start feeling frustrated with a dog’s behavior, think about what you want the dog to do instead of the problem behavior. Is it on that list? If so, you just solved your problem, and if not, you now know what you need to train! We all feel a little frustrated with our dogs’ behavior at times, but these three lists will help you to move past that frustration and start finding a solution. This entry was posted in Deciphering Dogs, Tips and Tricks by megan. Bookmark the permalink.